iPhone's built-in Photo app makes it simple to speed up slow-motion videos you took with your iPhone 5S or later and convert your slo-mo video back to normal speed. But it lacks the competence to manipulate the speed of normal video (4k/1080/720p 60/30fps) or fast motion (time lapse) footage taken by iPhone. Don't be upset, we are going to make your iPhone video in slow motion and fast motion in post processing with VideoProc. Want to Speed up/Slow Down Your iPhone Video?? - Change the speed of iPhone video from 0.1X slower to 16X faster. - Convert iPhone slo-mo video from 240fps/120fps to 60/30/24fps. - Adjust video resolution from 4k to 1080p/720p and vice versa. - Convert video to/from iPhone, e.g. HEVC to H.264, AVI to MOV, MKV to MP4, etc. - Edit, cut, trim, crop, merge, deshake, denoise iPhone video, add effects, and more. If you want to make your iPhone video play faster or slower than original speed, you can use VideoProc to edit the iPhone video playback speed up to 16X. It is a fresh desktop app that is flexible to adjust video speed like 0.1X, 0.25X, 0.5X, 2X, 4X, 8X and 16X. On top of that, it is pretty simple to do any video processing tasks, be it speed control, quality enhancement, video editing, or encoding. Just follow the steps below and learn how to speed up and slow down your iPhone Video easily. 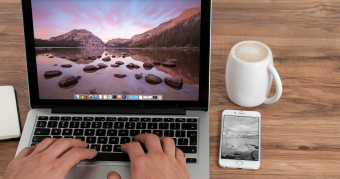 Prior to downloading and installing VideoProc on your computer, make sure to transfer your video content from iPhone to Mac or PC first. Launch VideoProc, click Video icon on the main interface, press +Video button to add the iPhone video from your computer hard drive. 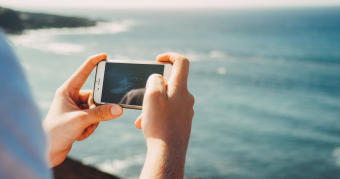 VideoProc accepts any video took from any smartphone, camera, camcorder or drone. Click Rotate button under the pending file to get access to the Video Edit panel. You can preview the video as per your needs and then press Done. At the bottom of the interface, you are allowed to choose the target format as you want. You can keep the iPhone MOV H.264 video unchanged or choose MP4 H.264 as the output format in case of wider compatibility with HDTV, gaming system, smartphone, or tablet. Click Browse button to save the resulting file in the output folder. Press RUN button to begin the speed and video duration adjustment. 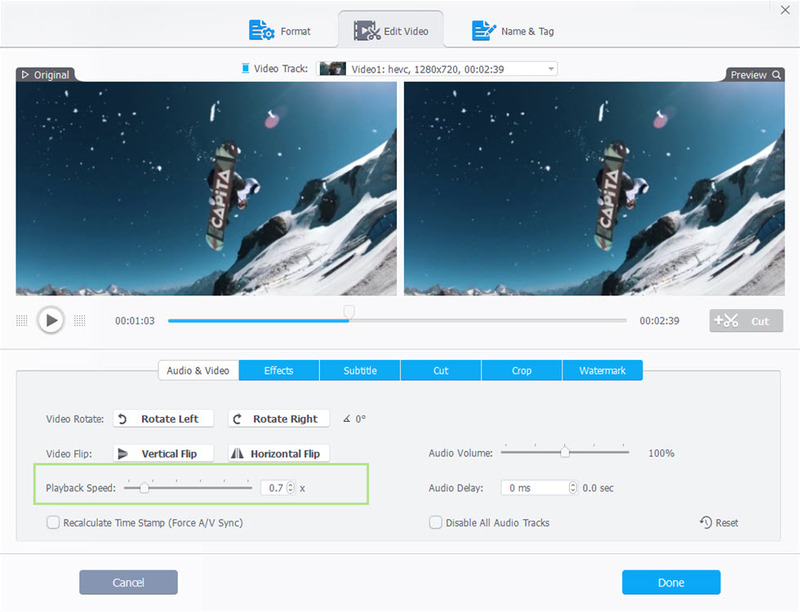 With full GPU acceleration, VideoProc enables a quick video processing of any video sources. 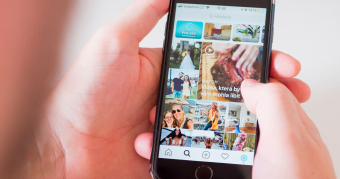 iOS users get accustomed to using iMovie to do some basic edits on iPhone without downloading any third-party software. If you want to increase and decrease your video speed on iPhone but don't know how to do with iMovie, just check the iMovie tutorial below. Step 1: Launch iMovie app and open your project. Step 2: tap the iPhone clip in the timeline to reveal the inspector. Step 3: Press the Speed button at the bottom. Step 4: Drag the slider bar right to the rabbit-shaped icon to speed up the video or move the slider left to the turtle-shaped icon to slow down the iPhone video. Step 5: Click Done and choose to Save in HD 1080p, 720p, 540p or 360p as per your needs. * 2X means twice faster than the normal speed while 1/2x means 2x slower the normal speed. Indeed, iMovie offers an easy way to adjust the speed of iPhone video. But there are something you need to take into consideration whether to use VideoProc or iMovie for iPhone video speed control. Read on and make your decision later. 420+ device profiles for iPhone, iPad, Android, PSP, TV, etc. 1. iMovie for iOS offers flexible speed adjustment ranging from 1/8 to 2x. But if you want to apply a fast forward effect by more than 2x to reduce the total time, try VideoProc. 2. The iMovie's 2x speed option is available on iPhone 5S or newer models. 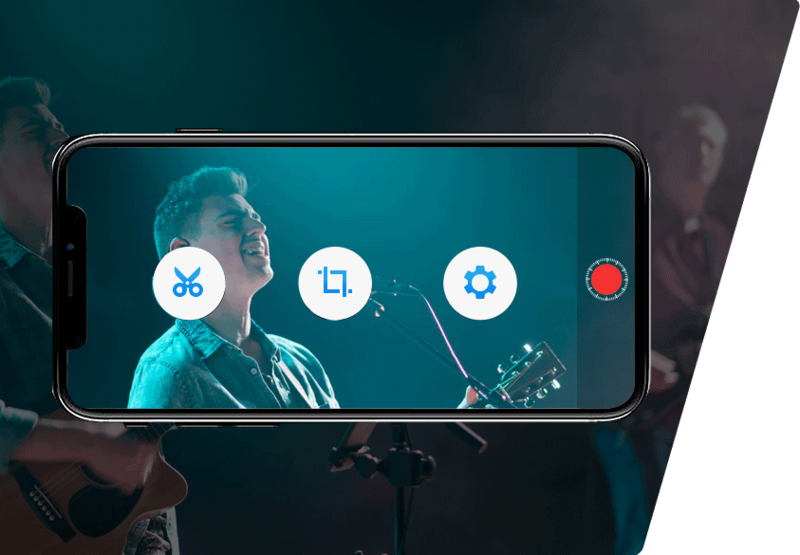 If you shoot video with iPhone 5 or older version, VideoProc is a nice option, which is compatible with all generations of iPhone models, including the latest iPhone XS (Max). 3. If you just focus on unnoticeable speed adjustment and would like to upload your footage on Facebook or YouTube directly, iMovie is a good choice. While VideoProc just enables to encode iPhone video to output format optimized for the video sites. 4. 4k 60fps is excluded from iMovie video export option. To keep the video quality unchanged, try VideoProc. It even makes the iPhone video in a much slower/faster timeframe as per your needs. 5. To speed up or slow down your iPhone video while saving your iPhone space without any loss of quality, VideoProc is your best mate. According to our test, a 7-second iPhone MOV video sized in 8.97 mb is compressed to 4.65 mb in iMovie but 3.71 MB in VideoProc when it is speeded up twice faster. While the size of iPhone MOV video is increased to 15.3MB in iMovie but 1mb decrease with VideoProc when the iPhone video speed is decreased by 2x. 6. VideoProc allows you to speed up or slow down multiple iPhone videos at a time speedily and easily. But with iMovie app, there isn't the option to do the tasks. 7. Doing the iPhone video speed adjustment with iMovie app means you have to be confined to the small 6.5" screen. So chances are that you may be involved in misoperation. But desktop VideoProc operates the speed control on computers that are generally as large as 22 inches. So more details are shown and accurate operation is done. Import iPhone recordings to iMovie for speedup or slowdown. 1 click to merge and combine iPhone 4K clips into a single one.